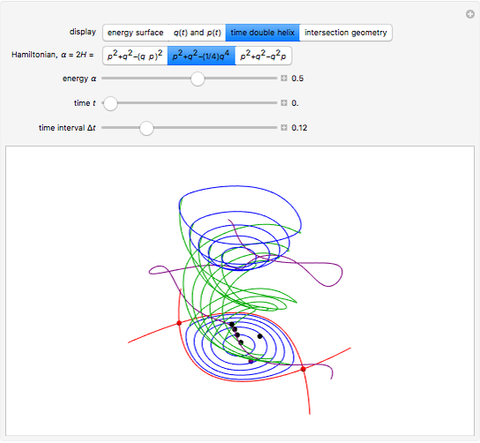 Using a birational transformation given by Harold Edwards (see Details), we apply the elliptic function to solve time-dependence of anharmonic oscillation along the Hamiltonian surfaces and [1, 2]. After a shear symplectomorphism, the same solution also applies to the unusual cubic, . Use this Demonstration to compare time evolution, point-to-point addition rules and intersection geometries. 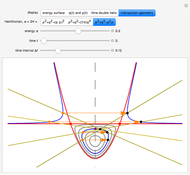 with the nome calculated by the Mathematica built-in function EllipticNomeQ. Solution of relative to is guaranteed up to scale according to the pole-and-zero structure over (Cf. , section 20). Comparison with the standard solution in terms of Jacobi elliptic functions verifies this assertion . It is also possible to compare with numerical solutions to the equations of motion; however, discrete analysis makes for even better validation and deeper insight. by chords. The iteration notation is consistent with cryptography literature . Point iteration is not limited to the chord-and-tangent construction. Addition rules with hyperbolic and cubic intersection geometries exist for quartic surfaces and [7, 8]. These are unified rules, which avoid case splitting. taken along surfaces and . Both integrals evaluate in terms of Gaussian hypergeometric function [10, 11]. H. M. Edwards, "A Normal Form for Elliptic Curves." Bulletin of the American Mathematical Society, 44, 2007 pp. 393–422. doi:10.1090/S0273-0979-07-01153-6. B. Klee. 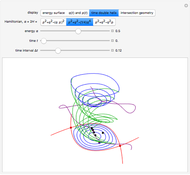 "Edwards's Solution of Pendulum Oscillation" from the Wolfram Demonstrations Project—A Wolfram Web Resource. demonstrations.wolfram.com/EdwardssSolutionOfPendulumOscillation. W. P. Reinhardt and P. L. Walker, "Jacobian Elliptic Functions", NIST Digital Library of Mathematical Functions, Chapter 22. dlmf.nist.gov/22. B. Klee. 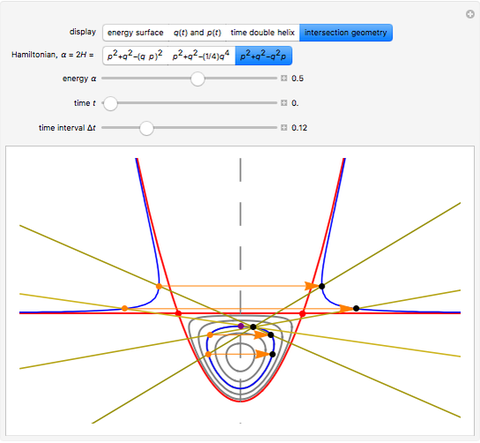 "Weierstrass Solution of Cubic Anharmonic Oscillation" from the Wolfram Demonstrations Project—A Wolfram Web Resource. demonstrations.wolfram.com/WeierstrassSolutionOfCubicAnharmonicOscillation. J. H. Silverman and J. T. Tate, Rational Points on Elliptic Curves, Cham: Springer, 2015. doi:10.1007/978-3-319-18588-0. C. Costello. "Pairings for Beginners." (Apr 4, 2018) craigcostello.com.au/pairing. C. Arene, T. Lange, M. Naehrig and C. Ritzenthaler. "Faster Computation of the Tate Pairing."arxiv.org/abs/0904.0854. D. J. Bernstein and T. Lange. "Explicit-Formulas Database." (Apr 4, 2018) hyperelliptic.org/EFD. T. Hales. "The Group Law for Edwards Curves." arxiv.org/abs/1610.05278. N. J. A. Sloane. The On-Line Encyclopedia of Integer Sequences. "a(n) = binomial(2n, n)^2." oeis.org/A002894. N. J. A. Sloane. The On-Line Encyclopedia of Integer Sequences. "a(n) = (4*n)! /((2*n)!*n!^2)." oeis.org/A000897. Brad Klee "Discrete and Continuous Quartic Anharmonic Oscillation"